Here we go. The big one. 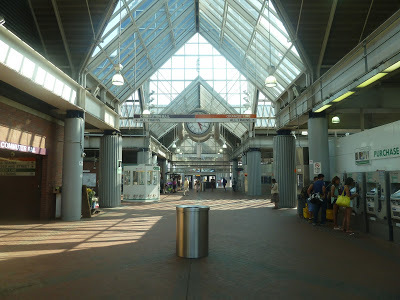 The huge Orange Line terminus featuring a bunch of bus connections on two different busways, a Commuter Rail platform, and even some retail inside the mezzanine. We shall wait no longer, and commence this review of the monster hub known as Forest Hills. This exterior is almost iconic. I love the Forest Hills building! Made mostly of metal and glass, this huge structure looks great. And you can’t forget the clock tower that rises out of the center. There’s actually another clock in the mezzanine that corresponds with the one outside, which is really cool. The big building isn’t the only way to the platform, though. Well, yes it is, but there’s another exit from the platform. 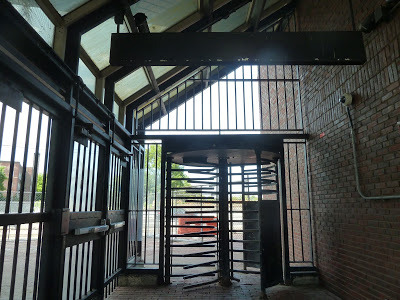 It’s similar to another exit at Back Bay, with doors and a turnstile leading out. It’s simple, but it can be useful for getting to places north of the station. The 39’s bus stop, taken about a month ago. Annoyingly, the 39 is separated from the Forest Hills busway. 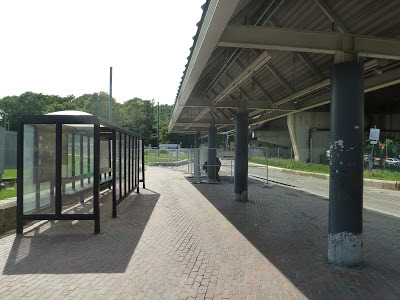 It gets its own mini-busway, where the E Line would terminate if it still went down to Arborway. It has a few shelters, and the old streetcar tracks are cool, but its signage from the main building isn’t the best. Actually, I think the 39 uses one of the main busways now, thanks to construction on the Forest Hills overpass, but I’m not certain. Around the side of the station, there’s a Pedal and Park with room for…x amount of bikes. I dunno how many exactly, but it’s probably a lot. Forest Hills also has a small parking lot along Hyde Park Ave – by small, I mean not big enough. With only a little over 200 spaces, it gets filled up quickly on the average weekday. Yes! I love this mezzanine so much! Forest Hills’ mezzanine is just amazing. With huge skylights covering most of it, there is so much light that gets in here. It has a huge clock right in the middle of it, and even a few shops to grab a quick (albeit not very good) bite. There’s even a bus countdown clock that shows when the next bus is leaving on every route that goes to Forest Hills. Amazing. Forest Hills is divided into “upper” and “lower” busways, but I’m not really sure why they’re called that. I guess the lower busway is lower in elevation, but “east” and “west” would make more sense, I think. Anyway, this busway is totally sheltered, with a fair amount of benches to wait. It’s served by the clump of buses that go down Washington Street, as well as the 38. That’s a lot of routes, and it can be hard to find them, but it’s a fine busway aesthetically. I find the lower busway to be slightly dingier than the upper one, probably because of its blander architecture. In order to get to it, you have to go down some stairs or an elevator. Despite only serving five routes, it’s still hard to find where buses pick up. There are plenty of benches, though, so at least there’s a place to wait after you miss a bus because you couldn’t find it. 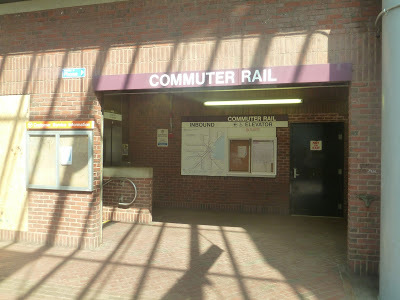 The entrance to the Commuter Rail platform. The Commuter Rail even stops here! 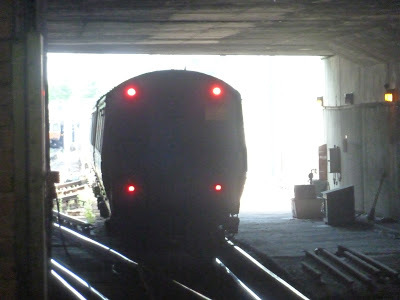 Admittedly, it’s only the Needham Line – the Providence and Franklin Lines go through here but don’t stop. To get down to the platform, there’s a set of stairs as well as an elevator, accessible from the mezzanine. OH NO! I’M GETTING BACK BAY FLASHBACKS!!! Yes, Forest Hills’ Commuter Rail platform is pretty Back Bay-esque. It’s really, really dark, and really, really bland. It doesn’t even have any artwork like the steam train on the high-floor Back Bay platform. I mean, Forest Hills even has dripping water from the ceiling…just like Back Bay! Man, these underground Commuter Rail stations just can’t get it right, can they? A Commuter Rail train passing through the station. There’s also an unsheltered part of the platform that goes pretty far out. It literally has nothing on it except for some lights and some nonfunctional LED screens. I can’t see why anyone would ever wait there, unless they wanted to escape the gloom of the underground station…so yeah, actually, that’s a pretty good reason. Okay, back to the mezzanine. Finally, we’re heading down to the Orange Line platforms. Now, the mezzanine has a bunch of fare machines spread all over, and a fair amount of fare gates, as well. From there, there’s an elevator down to the platform, as well as two sets of stairs and escalators. Also, there’s some art in this area, but it’s kind of underwhelming and not as impressive as, say, Jackson Square. The platform is pretty much the same as the previous two stations I’ve reviewed. It’s kind of dark, despite natural light getting in from the entrance. However, there is a good amount of benches, but they’re those ugly Southwest Corridor benches. Since Forest Hills is a terminus, both platforms serve inbound trains. Thus, there’s a convenient “Next train” sign to let people know which train to board. Now let’s get out of here. Ridership: Very, very high. As the 9th busiest station on the system, Forest Hills gets an average of 15,150 riders per weekday! 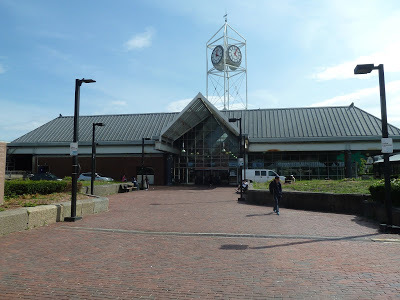 And as for the Commuter Rail station? Well…112 inbound riders per weekday. Okay, well, that’s significantly less, and I doubt there are too many outbound riders, either. Hey, it’s just the Needham Line, what do you expect? Pros: This station is a huge hub! With an Orange Line station, a Commuter Rail station, and over 15 bus routes, there’s a lot of stuff here. And they’re all connected by an excellent mezzanine. Seriously, that’s probably my favorite part of the station. 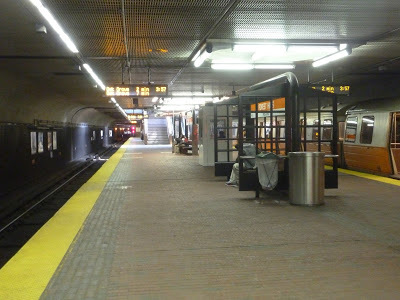 In addition, the Pedal and Park is convenient, and although it’s kinda bland, the Orange Line platform is standard for the Southwest Corridor. Cons: The busways are really confusing, but individual schedules and signage try to alleviate that. Something more important is that Forest Hills does not have nearly enough parking. It gets over 15,000 people a day! A measly 200 spaces isn’t gonna cut it. 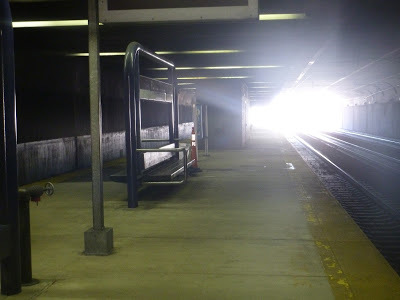 In addition, the Commuter Rail platform is pretty horrible. I mean, it’s not as bad as Back Bay, but it’s hard not to see the similarities between the two. 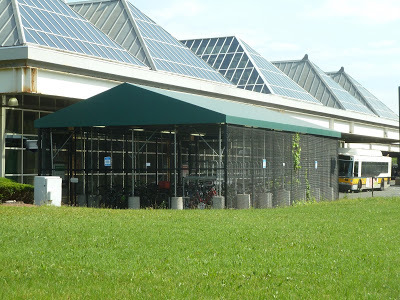 Nearby and Noteworthy: Surprisingly, the station is mostly surrounded by greenspace. Aside from a few businesses on Hyde Park Ave, the immediate surroundings of Forest Hills are mostly either houses or parkland. Well, I guess “Forest” is right in the station name. Oh, how I wish I could convince myself to give this station a lower score. I mean, Forest Hills has so much wrong with it! 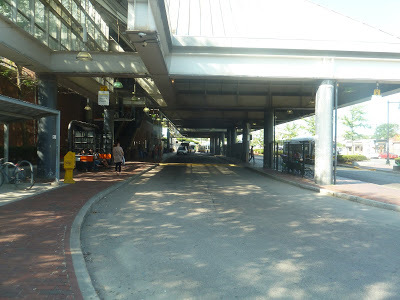 Still, though, the MBTA does try to fix the busway problem, and hardly anyone uses the Commuter Rail station. That leaves the parking issue, which really is a major one, but there doesn’t seem to be much room for more parking. I’m not sure if there’s much that can be done about that. And come on, the mezzanine? Simply amazing. UPDATE 12/27/18: This station has seen some huge upgrades since I last visited it on this blog. Check out this post to see them. The thing about the 39 bus is, it's essentially the replacement for the Huntingdon Ave streetcar that used to go to Forest Hills . 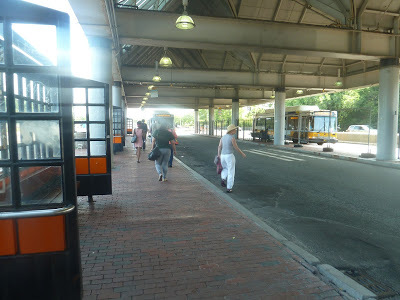 I guess the MBTA thought the change would be more palatable if the bus left from where the streetcar used to — you can still the old turnaround track. But it is confusing if you don't know all this, and you're in the station looking for the 39. The signage is not adequate. And by Huntington Avenue streetcar, you mean the E line before it was cut short. The "E" line, the Huntington Ave streetcar (although it's not really called that), never actually used the small green line station at Forest Hills. The turnaround was also never used by any green line trolley. Green line trolleys would drop off and pick up passengers inside of the Arborway Yard across from Forest Hills station. This last occured in 1985. The whole area was set up differently. Ummmm perhaps you were being sarcastic.. but of course nobody is going to take the commuter rail inbound from forest hills �� Why would you do that when you can take the subway for cheaper? That number only counts people who BOARD at forest hills, not the thousands of people who take the Needham line and pass THROUGH forest hills on their way downtown. Outbound is likely a bit higher but in my experience, most commuters get on the Needham line at south station or back bay. 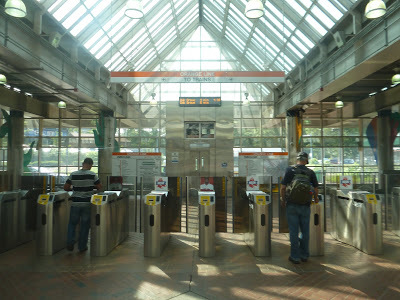 Not true… it can be more convenient to take the rail to South Station as a start to the Seaport area. I would love to see this updated some time in the near future since the massive construction and removal of the Casey overpass. Your thoughts on the impact on buses and traffic would be most welcome as well. 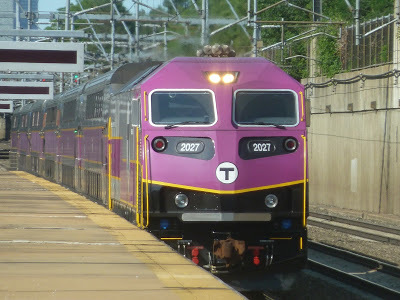 Does the commuter rail platform have bad diesel fumes and smog like back bay does? It’s not as infamous as Back Bay, but I’ll bet it’s pretty fumey.